This description doesn't actually sound that exciting to me... it's kind of overly long, sounds melodramatic and a bit too religious. Based on this blurb alone, I don't think I would pick this book up. But, I read the first book, and I loved it. So, I've been looking forward to the sequel pretty much since I set down Angelfire. Agreed. 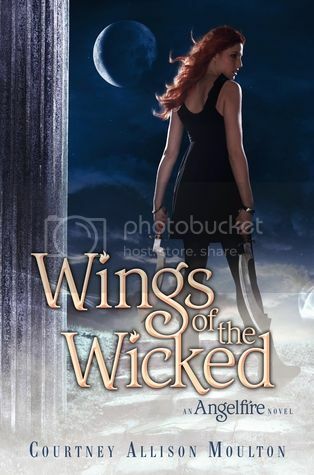 I really liked Angelfire so I too will follow through and read this one! YEAH!!! So excited for this one too! I really enjoyed the first book, though I think I'm going to have to reread it before I pick this one up because I know I've forgotten important things. Can't wait for more Ellie and Will! @Carol - rofl, that is a good one. Yes, the whole premise of this series is angels vs. demons. @Book Sake - I love your blog - I've got to remember to stop by there more often! I STILL need to start this series!!! I've heard great things about it :) Thanks for sharing...Great pick!!! Thanks for stopping by my blog earlier! I've been meaning to start this series, I've heard great things! Happy Reading!